I was asked to submit some of my art quilts in a textile art exhibt; Second Skin Textile Art Exhibit. 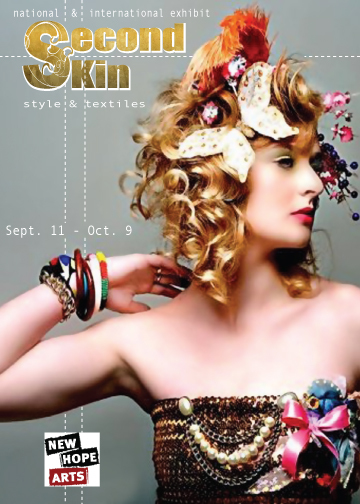 It is being held in New Hope, Pa at the New Hope Art Gallery Sept 11 – Oct 9th. 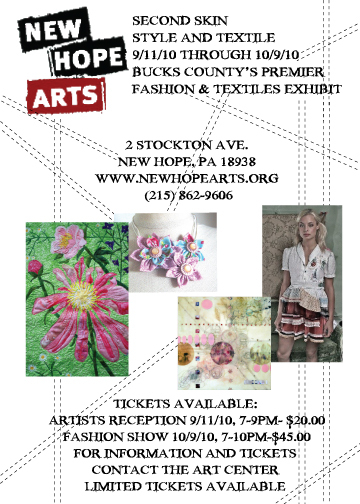 Here’s a copy of the flyer, with my art quilt pictured on the back! I had forgotten about this old post. The date of this event was 2010, you can barely see it on the flyer. That would explain the non functioning links. I’ll see about pulling this old news. BTW they may still be holding this event, I was given the impression it was an annual event. If you Google it, there must be a more current link. I appreciate you’re bringing this to my attention. I tend to post it & forget it, not a good idea I suppose. I’m concerned in particular about the slow loading time on my site, that you mentioned. I do have a lot of large photos, which could be effecting my loading time. It’s a hard balance to maintain, I’m a visual person and large photos are appealing to me, yet I don’t want that to the effect the loading time. Can you have your cake & eat it too? I guess that old adage would apply here. The answer to that question is still, “no”.. I just tryed their link http://newhopeart.org/ and it still worked. In fact they had some pictures of the fashion show associated with the event from that 2010 show.